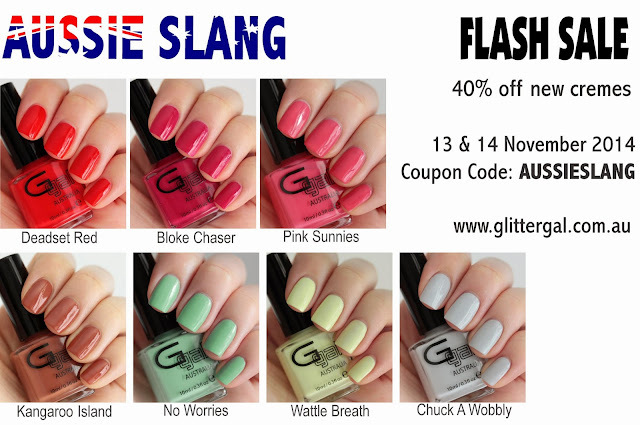 Gllitter Gal: Flash sale Nov. 13, 14 – week 1 - Be Glossy In and Out! Glitter Gal has a new collection out. They are starting an amazing promotion with lots of flash sales. This week's sale begins on Nov. 13 and ends Nov. 14. It's 40 percent off of their new "Aussie Slang Collection." These cremes shades are gorgeous. Glitter Girl provides international shipping. I am curious what will pop up next week. Stay tuned!